This Californian classic is among the top-producing Indica-dominant Kush breeds on the market today. Displaying large rock-hard "crown-shaped" colas. 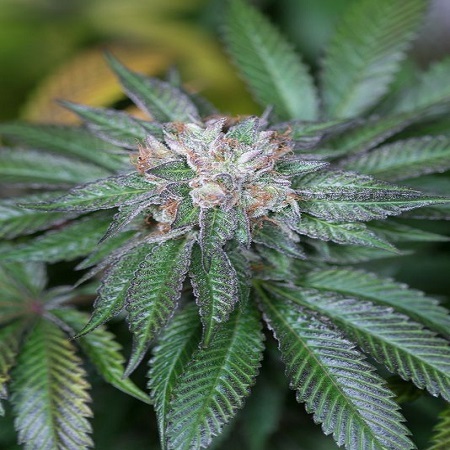 Master Kush Feminised Cannabis Seeds by Humboldt Seed Organisation: This Californian classic is among the top-producing Indica-dominant Kush breeds on the market today. Displaying large rock-hard "crown-shaped" colas, this elite clone boasts an extremely resinous glistening finish. With a long history that stems from an original Hindu Kush highland Indica crossed with a powerful and vigorous original Skunk phenotype, the result is a modern day icon in the cannabis industry that has been transferred through 3 generations of growers and breeders alike. Our elite version was crossed with Emerald OG to obtain a regular form, which was then intensively selected and backcrossed for another 4 generations. Unmistakeable because of its vast size and forest green hues, this "queen of Indica" reflects purple, orange and red highlights, making it quite easy on the eyes. Finishing in 9 weeks, this lady will not stretch much but is equipped with a powerful and aggressive root system that allows for stronger feeding schedules. Not much nitrogen is required to maintain its deep green essence, which allows flavour to be clearly showcased in the form of dominating pepper overtones accompanied by an earthy finish with hints of citrus that are distinct with every hit. This strain is recommended for beginners and experts alike as it is very grower friendly. Like most pure Indicas, one must be mindful both of its shallow canopy depths, that are due to its large broad leaves, and of its acute susceptibility to mildews and moulds. This is a must have as Preparation x Passion x Knowledge has equalled a connoisseur collector's edition while HSO continues to preserve the best of old lost genetics.